Microsoft SQL Server Reporting Services 2008/ 2008 R2/ 2012 Standard Edition or higher. XAML Rendering Extension installed in the server. Note: The extension must be installed ONLY for Microsoft SQL Server Reporting Services 2008/2008 R2/2012 Developer, Enterprise or Standard editions. Make sure that your SQL Server edition supports custom rendering extensions. Print reports as they are represented in the viewer (by default). Print document as it will be represented in the form of exported picture (UseImagePrinting). To view report in the viewer it is necessary to correctly specify SQL Reporting Services address and user credentials. NOTE: If you will not set ReportingServicesCredential, windows authentication will be used to access reporting services. It does not work if windows authentication is not enabled for the reporting services instance. It is possible to set response timeout for Reporting Services using the following property: ReportingServicesTimeout. Timeout is set in milliseconds . Third party export filters can be added to the Viewer. They will appear on the toolbar as a separate button. Report viewer management commands are available via special Commands property. 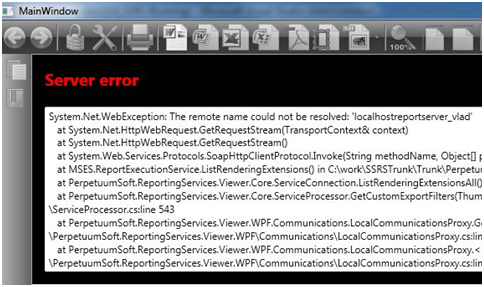 To override command you need to inherit from the PerpetuumSoft.ReportingServices.Viewer.WPF. ReportViewer class and override virtual methods: On<Command_name> and Can<Command_name>. The button is inactive because CanExecute of the ExportToPdf command always gets false. This is a complete error message. This is only an error message without Stack trace. This is a message of an error without specifying what the exact error is. You may use logging mechanism to get detailed information about error occurred. You may find English localization file in the Localization subfolder of product installation directory. This implementation of the logger writes data to the Output window of Visual Studio.